Artecy Cross Stitch. 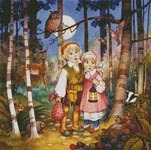 Cross Stitch Patterns of Nursery Rhymes and Fairy Tales to print online. Below is a gallery of the Nursery Rhymes and Fairy Tales Cross Stitch Charts we have designed so far, all the patterns are available to buy at our Artecy Shop. If you click on an image below you will see the full pattern details and a link to where you can buy the cross stitch pattern at our Artecy Shop.